The fact is that the competition for the streaming customer has only just begun. 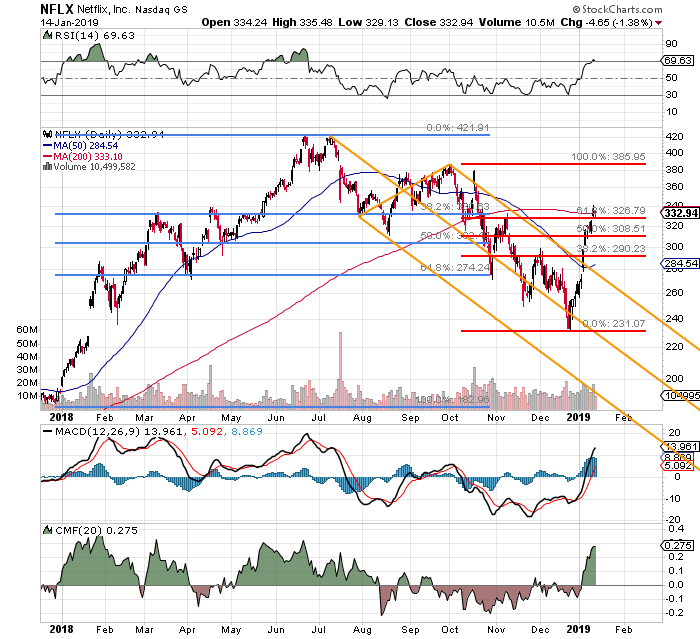 As regular readers are likely aware, I am currently playing Netflix (NFLX - Get Report) from the short side. Dangerous? You ain't kidding. I receive questions from readers on this position every day. My thought is that some folks are also short the name, and feel some sense of safety in numbers. Don't. This name is a beast, and the firm will report quarterly results this Thursday afternoon. Expectations are for EPS of $0.24. If realized, this result would show -41% performance year over year, and -73% quarter over quarter. Consensus view is for revenue of $4.21 billion. That number would be good for year over year growth of 28%. That is my point, exactly. Netflix is expected to have spent $13 billion on content for the full year of 2018. They have to, in order to out bid the rest of the industry for shows. This is what drives subscriber growth, and that is what - to this point - has driven share price. Not the fundamentals. The fact is that the competition for the streaming customer has only just begun. Currently, just Hulu and Amazon Prime pose a significant threat. The Walt Disney Company (DIS - Get Report) , Apple (AAPL - Get Report) , and AT&T (T - Get Report) are all expected to soon raise the stakes, and in the case of Disney, the firm is already king of content. Oh, did I mention that Alphabet (GOOGL - Get Report) is also a player in the space through YouTube, and that even Walmart (WMT - Get Report) has expressed an interest in capturing some of these eyeballs. My thoughts are this. Margins are going to be thinner. Operating Margins should print around 5% on Thursday. That will be down from more than 7% for Q4 2017, and 12% for Q3 2018. The cash burn is real. The firm borrows in order to spend all that dough on content. Total debt is growing as fast as is cash and equivalents. Can the firm maintain that pace in an era of rising competition? Does that competition, owner of a bevy of desirable content withhold that content as contracted obligations terminate? Or maybe they just extort more cash from Netflix? What if interest rates continue to rise? According to the Financial Times, Netflix has spent $291.6 million on interest payments alone over the January through September period of 2018. That number is more than the 12 month total of $238 million for all of 2017. My story is this. I am two tranches into an intended eight tranches that would comprise my intended position size. That's a quarter of the way in for the mathematically challenged. My net basis currently stands at $327.73, so as of last night's close.. I was down five bucks. The stock is higher overnight. The stock has clearly gone parabolic since Christmas Eve on expectations for subscriber growth mixed with a likely short squeeze. Momentum has been gifted the name by the hit movie, "Bird Box." Perhaps the firm has found a way to better monetize events such as this where they find themselves with a blockbuster success on their hands. That may in fact be the real risk to short sellers right now... how the success of that film is discussed in the post-earnings conference call. Technically, the name is now clearly overbought. Relative Strength, the daily MACD, and Money Flow are all at what I consider to be unsustainable levels. That said, never say never. I have indeed increased my short position by adding a tranche at $351. If opportunity presents, I will day trade that portion. First off, for those short and nervous... I am not short enough to get really nervous yet, but protection always crosses my mind... cover some. Plain and simple. I have stressed this over and over. If a position impacts quality of life, reduce said position to a size where it does not. That is known as understanding one's tolerance for risk. Another way to reduce the risk would be to buy a call that expires after the expected news event with a strike price that the investor finds acceptable. This protection will be costly, especially in a volatile name. The only way around that would be to partially subsidize the purchase through a sale of a similarly dated call with a higher strike price. The downside of this strategy, is that it re-opens the risk at a reduced level. Trader is short 100 shares of NFLX equity. Notes: Obviously, once NFLX opens on Tuesday morning, the strikes and premiums here would have to be adjusted. In this example, the traded has incurred a debit in aggregate of $8, in order to remove $25, or a net of $17 from the total loss in the event of what would be a catastrophic outcome for this trader. A fearless trader might further subsidize the strategy by selling a put at a level where the trader would be willing to accept the risk of having to buy 100 shares. That may open up a whole new can of worms, though, and that is strictly up to the individual. At the time of publication, Stephen Guilfoyle was positions: Long DIS, Short NFLX equity, Short DIS puts.